I have actually joined the bandwagon and I'm now a true matcha-lover convert. And my 11-year old daughter is so ecstatic. Our Danica used to be the only matcha-lover in the family. The mosaic taste of matcha used to gross me out. I can't seem to know,why, though I do love teas (all kinds of them), I never really fancy this one. Allow me to consider the matcha as an ever-growing taste, it is by far the preffered taste of the millennials. Now that matcha had become ubiquitous, everyone wants to get a load of it, excluding me, hahaha. But lo and behold, after taking a peek at Megaworld Corps. 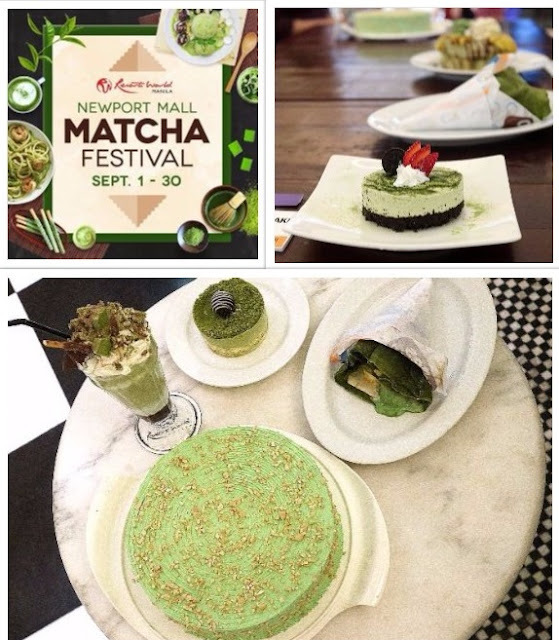 and Resorts World's Manila's newest food festival, dubbed as Matcha Festival, I gained a new insight about matcha and yes, I loved everything that was presented and made us sample. What used to be month-long chocolate savoring at the said premier lifestyle venue, a new light has dawned to their September-dining promotions. Believe it or not, a love-affair has evolved in between foodies and matcha, and Resorts World Manila pays homage to that by providing creative ways to indulge in this provocative Asian flavor. For the whole month of September, RWM signature restaurants and select Newport Mall dining establishments will put a Matcha spin on classic recipes, guaranteed to thrill everyone’s taste buds. Guests and diners can get their Matcha-fix from Impression, Ginzadon, Prosperity Court, Café Maxims, and Franks, as well as popular restaurants like Bulgogi Brothers, Mr. Kurosawa, Johnny Kahuku, TWG, Kettle, and many others. Matcha Overload, by Impressions (PHP 580). Savor the earthy flavors of green tea gelato, Matcha cannele, koignette with Matcha, and red bean macarons. Perfect Matcha, by Café Maxims (PHP 290/set, PHP 120/croissant, PHP 240/drink only). A fluffy green tea croissant filled with dark chocolate and almond flakes, and a cup of hot green tea latte. Matchadog, by Franks (PHP 195). An Asian twist on Franks’ Inasal Sausage, topped with Matcha dressing, nori, and more. Deep fried Matcha ice cream, by Ginzadon (PHP 180). Sweet, heavenly green tea ice cream coated in crunchy breading. Matcha Crumbles, by Prosperity Court (PHP 100). Indescribably delightful Matcha cookies with a healthy green tea taste. Swamp Shake, by Café Creole (PHP 285). Green Matcha Vanilla Milkshake with Almond Essence and Dark Chocolate topped with Marshmallow Smores, Green Tea cookie, Japanese Wafer sticks and Matcha dust. Wild Strawberry Crepe, by Crepes & Cream (PHP 200). Green Tea flavored crepe filled with strawberry fruit, strawberry ice cream and whipped cream, drizzled with strawberry sauce then topped with sprinkle of wafer crumbs and almond flakes. Peaches and Cream Crepe, by Crepes & Cream (PHP 220). Green Tea flavored crepe filled with peaches, vanilla ice cream and whipped cream, drizzled with caramel sauce then topped with cheesecake bites and sprinkle of wafer crumbs and almond flakes. Guaca Matcha Sansrival, by Johnny Kahuku (PHP 235/slice). Layered butter avocado cream cake with cashew merengue and Japanese Matcha frosting. Nori Fried Chicken with Matcha Waffle, by Kettle (PHP 399). Japanese-style fried chicken in nori and Cajun seasoning topped with white miso butter in a green tea waffle. Green Tea Sans Rival, by UCC Café (PHP 260). A buttery, nutty, crunchy and chewy sans rival with a Japanese twist, covered with matcha green tea buttercream. Recognizing that Matcha’s appeal goes beyond its flavor, a Matcha Art Exhibit will showcase examples from around the world on how a dusting of green Matcha magic can make the delicious also beautiful. The Matcha Weekend Market at the RWM Plaza will provide diners and shoppers with the chance to enjoy matcha-based goodies on-the-go and at home. I so love matcha too! Thanks for sharing, soon, Resorts World, soon! Good Lord! So much matcha! I want too!